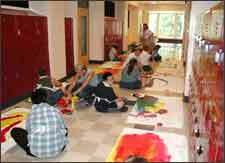 Workshop On Drawing Skills is an event that took place between 13-Jun-2005 and 13-Sep-2005 in Hyderabad. You have always painted the town red. Now is the time to try different colors. The School Of Arts And Crafts of the Literacy House, Andhra Mahila Sabha, is conducting a 3-month course on drawing. The course aims to train students in the fundamentals of arts and design. The students will be introduced to various drawing skills like still-life painting, lettering, geometrical drawing, memory drawing and nature drawing. The course will be conducted in two batches, Grade I and Grade II. The Grade I is the basic course and Grade II is the advanced one. Admission into Grade II is strictly through an entrance exam. The students enrolling for this course should have passed their 10th standard. The course does not have an age limit, and so is ideal for students, retired persons, house-wives, and also employed people. This course is being conducted by Toduri Ravi, a reputed artist, who has a double diploma in arts, and 15 years of experience in this field. This course is expected to help the candidates in their employement prospects in the field of art. Be the first to comment on Workshop On Drawing Skills! Just use the simple form below. fullhyd.com has 700,000+ monthly visits. Tell Hyderabad what you feel about Workshop On Drawing Skills!